These days we are constantly bombarded by pharmaceutical drugs, from the doctor’s office to TV commercials, there seems to be a magic pill for every ailment. 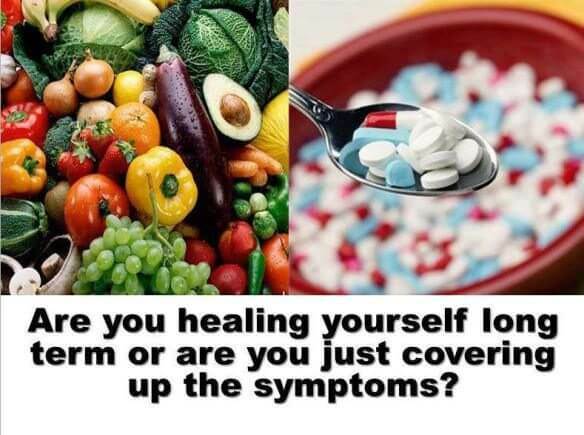 But are these prescription drugs actually healing us or are they just treating the symptoms? The body is incredibly intelligent and quite capable of fully healing itself, if we support it and get out of its way. Many medications actually make the condition worse while making the patient feel better. For example, steroid shots for back pain actually cause degeneration of the cartilage and spinal disks. Although they temporarily address the acute pain, the long term damage causes more pain than the initial problem. A much more effective route would be to support the immune system, allow the inflammation process (which is the bodies way of healing) to take place, while adjusting your normal activities that trigger pain, and be patient. Healing takes time. Seeing a physical therapist to help you learn better body mechanics, a chiropractor to treat any misalignments in the spine, and/or a massage therapist to relax the muscle tissue and improve circulation are great ways to assist the healing process. Incorporating light exercise like yoga, walking, swimming or chi gong can help speed healing time as well. Feeding the body with the essential building blocks it needs to maintain health is so important. A wide variety of vegetables, fruits, nuts, organic meats and nutrient rich grains helps maintain health in the body. Knowing the healing properties of certain foods can help turn illness around without dangerous medications. For example, ginger and turmeric are naturally anti-inflammatory, garlic and onion are powerfully anti-bacterial. Supplementation of vital nutrients is also important, especially at times when the body is in a healing state. When supported, the body naturally expels toxins, repairs damaged tissue and moves towards a state of homeostasis. Expecting to feel good all the time is unrealistic and unhealthy. Life is cyclical. There are times for forging ahead full steam and times for pulling back and recuperating. The body is a magnificent machine that communicates its needs to us through our sensations. If your body is crying out in pain it is asking you to slow down or maybe change directions. Listen to what your body is telling you, honor its needs and it will keep performing for you time and time again.